They say a picture tells a thousand words. Is this the ultimate cherry pick? 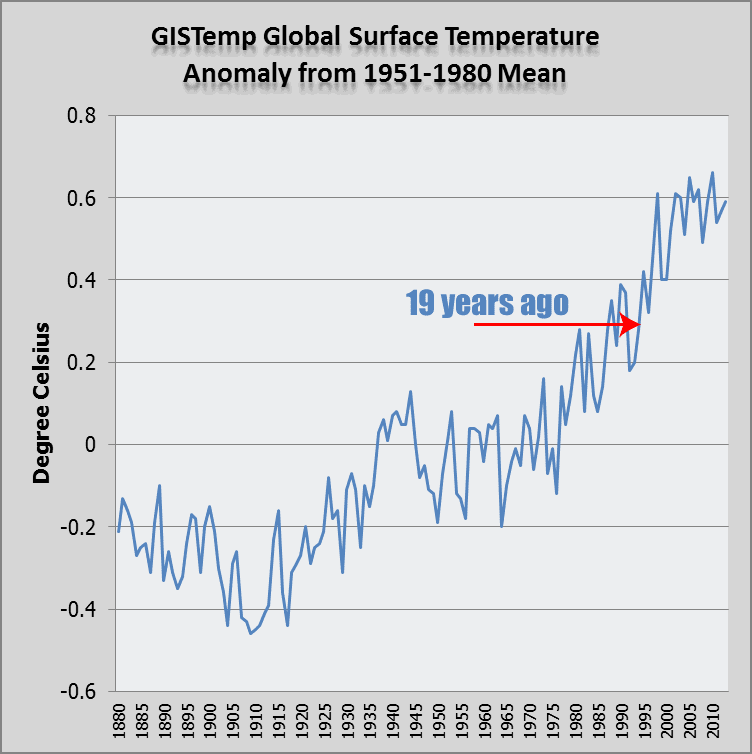 19 years of pause and 17 years of rapid warming. Anthony Watts wrote about a paper by Ross McKitrick (whose name Anthony mis-spelled). It was published in some obscure statistics journal (with zero impact factor), in which Ross set out to "prove" that global warming "paused" 19 years ago. To illustrate, Anthony put up the above chart. No, not both of them. Guess which one was Anthony's :) And I can cherry-pick too, can't I? Here, I propose a method for estimating the duration of the hiatus that is robust to unknown forms of heteroskedasticity and autocorrelation (HAC) in the temperature series and to cherry-picking of endpoints. If you need it, here's a link explaining heteroskedasticity and Tamino discussing autocorrelation, plus more here. Here's another chart, this time of GISTemp looking at global surface temperatures over the past few decades. I wonder if Tamino will bother to take on Ross McKitrick's latest effort? Perhaps eventually we will reach the conclusion that “the pause” extends to the 70s and “global warming” never existed to begin with. So he uses a method that requires that the data be trend stationary to show that the trend is not statationary but is lower during the 19y ‘pause’. Seems to have lost something in translation. :? Glancing at the HotWhoppery, I like BillyBob's reference to the 'sea ice thing' -- of course when presented with two papers that actually can be used to explore the science of sea ice reduction he chooses to ...remain ignorant. And this usually really is the heart of the matter, most pseudoskeptics *choose* to remain ignorant, it's a choice they've made. The basic physics isn't that hard to understand on a conceptual level. The misuse or abuse of statistics usually doesn't require an advanced degree to identify. "Cherry-picking" is one of the easiest statistical abuses to spot. When the results can make a 180 degree U-turn based simply on picking a start year, then you should know you've got an invalid test. BillyBob simply fails to understand this. He actually puts more credence in the past 10 years than in the past 35 years - yet I bet he thinks he understands statistics. Moreover, his ideas are not contained within any coherent, consistent theory. Just random blather. If you ask him if satellite measurements agree, or ocean heat content, or simple energy box models he'll just ignore and move on. A coherent explanation is beyond him. Facts and data points out of context are his stock in trade. What does Cowtan and Way say for the same period? IOW, it's a double cherry pick. Haha, "Scientific Research: An academic publisher." Anyone else would say "A predatory journal." And I wonder who paid McKitrick's open access publishing fees? I note it says "Received 16 June 2014; revised 20 July 2014; accepted 1 August 2014". That's pretty quick turn around, 1 month from initial submission to resubmission. Must have been a really tough peer review!! SCIRP is on Beall's list of Predatory Open Publishers. And for good reasons. I did a quick check of some of the members of the editorial board, and it was interesting to note that Tae Hwy Lee mentions in his CV that he is on the editorial board of "econometrics", but he does not mention OJA. Also Jianguo Sun doesn't mention this, but does list several other journals for which he is on the editorial board. This paper is clearly bogus -- well, beyond bogus -- but a short turnaround in and of itself doesn't necessarily indicate a careless refereeing job. On occasion I've turned short, obviously competent, obviously correct papers around in a matter of hours! Which remaining bit of "the pause" are you referring to, Billy? Half of it is gone, per Cowtan and Way. There's a collection of residuals being gone through at present, necessary for our better understanding but not really required for justification of model output. So where's your missing heat? What's your bet? Still don't understand regression to the mean, Billy Bob? No point talking to you about power or autocorrelation if you don't even know what regression is. Why do you bother talking about science at all, if you know so little? These idiots do not know the difference between integral equations and partial differential equations. They barely understand so called linear relationships of complex variables that are not totally dependant. They are morons in a class of their own. The Denialati! Wait till they realize there are partial differential equations that can be expressed as partial integral equations. It gets far worse! There are proofs of theorems that can reduce a third order integral to a two order integral! In case the idiots did not know the laws of Physics are followed by all non sentient particles. The idiots only think they are winning! Bert, no need to know anything about those darn equation things, when all you need it eyeball a graph, à la Meteormike! I like that it has degraded into who can make the most unabashed cherry pick. "I know you are but what am I?" Did you think I was serious in chart one? Seriously? If you've been involved in discussing this topic for a while, you'll realise that determining if someone is being ironic or not is incredibly difficult. There is a small hint in the sentence "And I can cherry-pick too, can't I?" Too subtle I guess. I can't believe that Watts would try that stunt. It's not even a "normal" cherry pick, where you choose your start and/or end-points for an OLS linear trend to misrepresent the trend. Here is a WfT chart showing OLS trends in 2-year steps from 1991 to 1997. Notice how many linear trends are down. "Is this the ultimate cherry pick?" I'd have thought that the 'Arctic ice recovery' based on a 'long term trend' all of 2 years long would trump it by several galaxies. Einstein once said that insanity was doing the same thing over and over again and expecting a different result. The denialati keep repeating the same false mantras that have been demolished by reputable science. They keep regurgitating the same vile nonsensical vomit that my dog would not touch. He is far smarter!